As we all observed and experienced, the close of 2018 brought an unsettling time in the equity markets. Markets historically don’t respond favorably to uncertainty, be it financial, political or social, and recent volatility appears to be tied to a host of uncertainties. Many individual investors react to uncertainty based on emotion, even though we’ve seen throughout the history of the market how important it is that investors don’t allow emotion to influence decisions. Throughout recent market volatility, we have stayed disciplined in employing our consistent investment strategy at CCM. Adhering to a consistent strategy means that our team knows what to do in all types of market conditions.When faced with a time like this marked by volatility, we rebalance—which helps us to buy low and reduce risk. We harvest losses when appropriate— which reduces current and future tax liability. We set aside money for future cash flow and expenditures—which assures we won’t sell any asset class at an inopportune time. To reiterate our December message, our constant focus is to be your partner in attainment of your long-term financial goals. While volatility is unpleasant for all of us, we know that it is part of the ride we are on as investors. It is core to the tenets of risk and reward, and managed appropriately it is a very key component for long-term success. 1. Is this a good investment choice considering all the alternatives? This question can be asked about an individual stock or bond, a sector or asset class, equities or bonds in general, or a whole host of investment choices and investment vehicles. 2. Is this the right time to invest? This question arises as one may be thinking about if the economy is strong or weak, if there is going to be a recession, or if markets seem to be overpriced or underpriced. At a more detailed level, they may be wondering about an individual company that has an exciting new product to launch that could significantly increase profits. Or what about a new competitor coming into the marketplace that will challenge a company’s profitability? We know these are important questions and how we build and manage our clients’ portfolios need to address both; what are good investments and what is the right time (or wrong time) to invest? For this update we are going to focus primarily on a dimension of the first question, but know that we have considered both questions (and more) when we manage your investments and create your financial plan. As a member of our Investment Committee at CCM, I am part of a group tasked to query, challenge, and oversee our team as we determine how to build what we believe to be our best possible investment portfolios. A core principle on which we operate is that decisions are evidence-based. In this regard, our investment team recently shared a study on diversification, published by Hendrick Bessembinder, Professor of Finance at Arizona State University. For this quarter’s Investment Insight, I wanted to highlight this work as I think the study makes some very interesting and important observations that are relevant to CCM clients. Investors are constantly bombarded by prognosticators and influencers who are pitching something that purports to be superior to the alternative. In the financial world, the loudest voices are often those who have a vested interest in a product sale; are suggesting one should follow them (e.g. active managers) because they have a “crystal ball” that is more clear than others; or they may be part of an organization providing financial insights as a means to sell newspapers or other content. Putting aside the “noise” that can distract investors, the evidence is conclusive—it is very, very difficult to choose individual securities or investment vehicles that beat a diversified portfolio’s return. Especially in times of volatility there can be an emotional desire to “do something” even when it is not supported by evidence and is certainly not in one’s best interest. Your portfolio is invested in more than 13,000 companies across the globe.This is traditionally highlighted as it relates to reducing risk, but equally important is that a globally diversified portfolio assures that you will capture the long-term excess return of stocks over safer fixed income investments. It is a fool’s game to think that anyone can consistently or predictably choose the 4% of stocks that will outperform a diversified portfolio. CCM’s investment approach ensures you are not subject to that type of risk. We position your portfolio to efficiently capture the returns that have consistently provided favorable results over the long term. 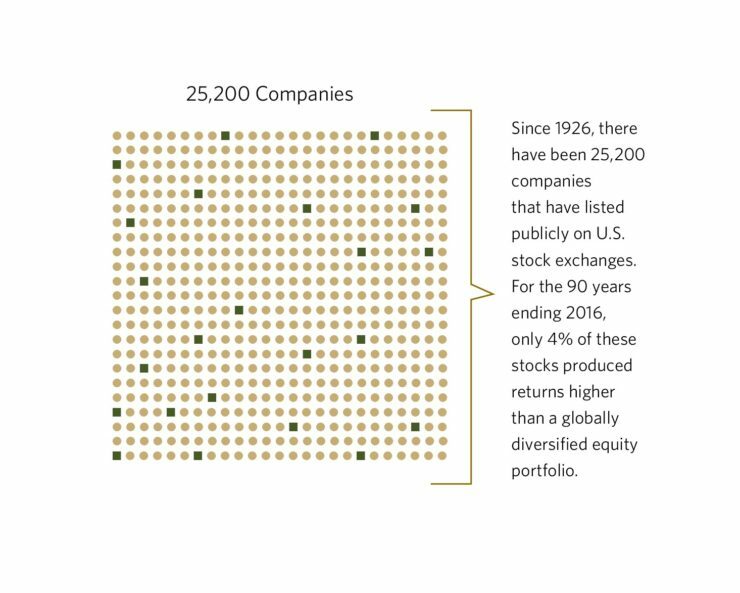 Owning a diversified equity portfolio does not totally protect one from market declines, as evidenced once again by performance in 2018 (in fact, on average, equity returns have produced negative returns in about one of every three years). Equity diversification, along with a fixed income (bond) allocation within a portfolio, further reduces the likelihood of negative returns. This approach, managed well—and as part of a carefully designed overall financial plan—will produce the strongest likelihood for success. At CCM, we understand the discomfort that comes when the markets are performing erratically. It is important to us that even when we experience this kind of unrest, that our clients are still afforded peace of mind. This is what inspires us to continue to highlight quarterly insights and updates that relate to the underpinnings of our investment approach and how they tie to your portfolio.This has been a priority at our firm since our founding. CCM’s Investment Committee and investment team are tasked with always challenging our investment philosophy, strategy, and execution with a singular focus—working to improve your results and investing experience. Along with our other team members in the disciplines of tax, estate, retirement, risk management and philanthropy, we are committed to being your trusted partner, working with you to help your wealth reach its full potential.